Contact Energy says Mike Dunstall is an authentic and inspirational leader who has significantly contributed to the company’s geothermal work programmes and the geothermal industry in general. As a member of the executive management committee and leader of geothermal drilling and the production and reinjection strategy, Dunstall played an integral role in the delivery of the Wairakei investment programme. The programme has reduced the average cost of generation from Wairakei and is providing additional flexibility in the field. It involved building the $623 million, 166 MW Te Mihi Uenukukopako (Te Mihi) geothermal power station, adding extensive steam field connections, the drilling of 22 new wells, and development of the Wairakei Bioreactor. Dunstall and his team were responsible for the innovative strategy to retain steam supply to the existing 57-year-old Wairakei power plant while still providing for the supply of the new Te Mihi development. Contact anticipates that the strategy will eventually boost revenues by $40 million to $60 million. Contact says Dunstall has also brought that focus on innovation into daily operations. His team now carries out live well work- overs and the company was the first geothermal operator in New Zealand to use a broaching intervention. The company has since regained 22 MW of production for less than 5 per cent of the typical cost of completing 14 well work-overs using a drilling rig. Health and safety is a key focus for Dunstall, not only for Contact employees but also for the companies contracting to it. In the past year he facilitated Contact’s Taupo Contractor Safety Forum and spoke at the Business Leaders’ Health and Safety Forum. Dunstall has also played an important role in the company’s stewardship of the resource it relies on, and in its dealings with the Waikato Regional Council and local iwi. He oversaw the company’s research programme into subsidence at Tauhara, which provided assurance to the wider community that the mechanisms of subsidence are well understood, monitored and reported. He led the negotiations which saw the Tauhara Moana Trust incorporated into the Tauhara II project. He also played a key role in achieving a joint venture agreement with the Taheke 8C and Adjoining Blocks Incorporation for the exploration and development of the Taheke geothermal field near Lake Rotoiti. Dunstall is involved in a number of industry organisations and has published 35 academic articles since 1993. 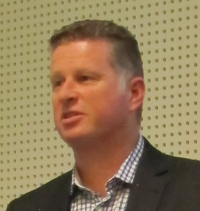 He is a member of the New Zealand Geothermal Association, where he has also been a board member, and the International Geothermal Association. Mike also sits on the editorial board for Geothermics – Elsevier Science, one of the primary scientific journals for geothermal science and engineering. Earlier this year he led a team of 25 at the World Geothermal Congress in Melbourne. Contact says Dunstall is a popular leader whose knowledge and passion has enabled him to build a highly-skilled team of 35 who are recognised worldwide for their expertise. The depth of talent in the team is unparalleled, and is a key asset for Contact as an organisation.